Mr. PAUL. Mr. Chairman, how much time do I have remaining? The CHAIRMAN pro tempore (Mr. HASTINGS of Washington). The gentleman from Texas has 3½ minutes remaining. Mr. PAUL. Mr. Chairman, I yield myself such time as I may consume. I do not believe for one minute this is a surrender to the drug war. This is an acknowledgment that the $250 billion we have spent over the last 25 years has not worked; that the strategy against drugs is wrong. Why continue a war that does not work? This is money down a rat hole. This is totally wasted money and, as far as I am concerned, only an excuse to sell helicopters and go in to Colombia and protect oil interests. That is the real reason why we are down there. We say this is only replacement of money for Kosovo. Well, what makes us think if we put the money in and replace it the President will not do the same thing over again? Of course he will. The fact that we are not watching the purse strings tightly enough is the problem. The gentleman suggests that this would mean that there would be no more building and no support for our troops in Korea. My amendment only deals with the money in this supplemental. What about the current years budget? Those funds can still be spent. But it also suggests that we shall question how long are we going to be in Korea. It is time to start thinking about these matters. It is time to bring these troops home. If we want to spend the money, spend it here at home. Spend the money here. Build up our national defense. If we wish to continually expand our interventionism and aggravation overseas, then I guess we have to vote against this amendment and for the bill. But this is a policy statement. Should we continue current policy of forever spending money and being involved overseas? I say it is time to start thinking about what is good for our people, what is good for our taxpayers, what is good for national defense, and what is good for our constitutional republic. Should we be doing this? I do not think so. Are we authorized to do it? No, we are not authorized to police the world. This is the furtherest stretch of the imagination to believe that what we are spending here on this budget, especially what we are going to do in Colombia, has anything to do with national security. What are we worried about? Are the Colombians going to attack us? This is not national security. This is special interest spending. This is conservative welfarism; that is what it is. We condemn all the welfare from the left, but we always have our own welfare on the right, and it is not for national defense. We should do less of this military adventurism overseas and put it into national defense, take better care of our troops, which would boost morale, and increase our ability to defend our country. But, instead, what do we do? We subsidize our enemies to the tune of many billions of dollars for a country like China at the same time, when they are aggravated and annoyed with Taiwan, we send more weapons to Taiwan and then promise to send American servicemen to stand in between the two of them. Some day we should ask the question of whether is this policy in good for us. I am frightened to think that this will only change either when we are in such a mess, a lot worse than Vietnam, or we totally go broke or both. But we should not wait. We should speak out and do what is best for our country. We have a good guideline as to what we should do in foreign policy, and it comes from the constitution, certainly we should note the tradition of the last 50 years. The Constitution gives us the guidance to pursue a proper foreign policy. 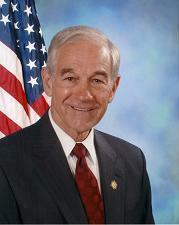 2000 Ron Paul 23:10 Some day we should ask the question of whether is this policy in good for us. probably should be Some day we should ask the question of whether this policy is good for us.